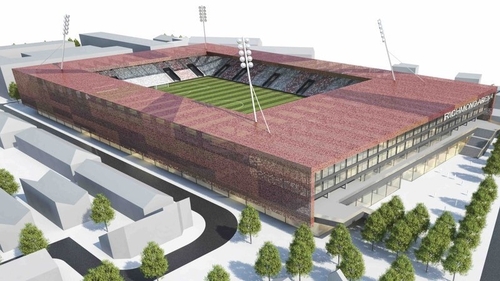 St Patrick's Athletic president Tom O'Mahony has appealed to fans to refrain from protesting outside the homes of local politicians as plans to build a 12,000-seater stadium in Inchicore look set to be rejected. St Pat's director of football Ger O'Brien labelled it "a nightmare waiting to happen". "Regardless of a stadium or not to lump more houses in to an area that has nothing in it is another nightmare waiting to happen," he tweeted on Friday. "1 maybe 2 proper restaurants in the whole area. No proper shopping facilities at all. 0 parking. And we are going to throw 500 more families in to an area that has had no help from anyone in decades." A petition to support St Pat's plans for the area was set up two days ago and has well over 2,000 signatures to date. On Saturday evening O'Mahony released a statement welcoming engagement with politicians but urging supporters to do so in the appropriate manner. "It has been brought to our attention that some of you may be planning to show your opposition to the Dublin City Council plans for St Michel's Estate by protesting outside the homes of local politicians or at the launch of the plans next Monday," it read. "We do of course want you to engage with local politicians. Do so by phone, by email, by letter, by talking to them in the course of their public engagements. Make your points in a friendly reasonable manner and please don't be abusive in any way. "We know that may politicians will be weighing up the Council's plans and deciding whether to support them or to argue for a rethink which would include our proposal. The last thing we need is to turn them against us!"